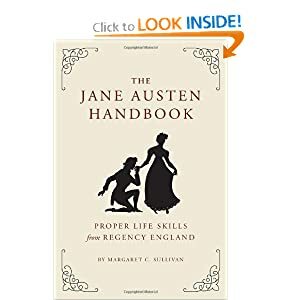 How To Become An Accomplished Lady, How To Attract a Man, Declining an Unwanted Marriage Proposal, and How To Dress For a Dinner Party While Staying at a Country House (a double-feature). My scores on the first few were pretty bad (as I expected) but recently, I've picked up a little momentum. Let's see what this week brings, shall we? Point of clarification: I don’t have "children,” per say. However, I do have a pair of furbabies, so really, this should be titled: How To Raise Your Furbabies. 1. Employ your servants to best advantage. The Handbook suggests hiring a trustworthy nurse so they can take over your duties after three months. Um….errr...I am the servant in this house. Bummer. 2. Keep them in the country as much as possible. According to The Handbook, furbabies need room to run about and play. And just like that, I’m back in the game!! As some of you know, I live in the pseudo-country! Just look! Here they are, running and playing about. With a friend, no less. 3. Employ the latest educational methods. When we first got Pickle, I read a lot of books. Mostly by Cesar Milan, who is arguably one of the most renowned dog trainers. Also, I read a book about positive encouragement instead of punitive punishment. Granted, Pickle ate a few pages from that book (literally) but still, I read and employed their suggestions. Err…some of their suggestions (like I was going to carry around bacon to sporadically reward Pickle for doing something good—eeeeew). To be fair, all our boys do is sit and stay on command, and occasionally come when called (unless there’s a squirrel or rabbit in the yard, obviously) but overall, they’re pretty well-behaved. The Handbook states that it’s important to teach furbabies to have pride in their position in society. Now, Pickle came to us with those principles ingrained in his personality. He’s what we affectionately refer to as our High Maintenance son, as he came from a breeder who thought he was the best-looking Yorkie she’d ever seen (she actually tried to get us to change our mind so she could keep him. True story). However, we adopted Pepi from a puppy mill seizure and our hearts broke when we learned about his past. So, we smothered him with love and attention and I’m pretty sure that he knows how good he has it now. Case-in-point: Doggie booster seats. 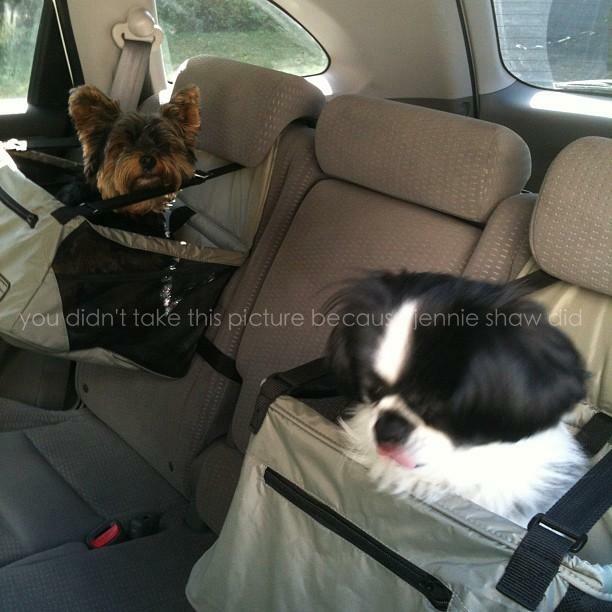 Yes, they're really in my car and to make it even MORE comfortable for them, they're lined with fun fur. Because simply being in the car, and seeing out the window isn't enough, apparently. This is done by giving them books to read and paper to draw. Well, that’s not really applicable to furbabies but look at their pile of toys! 6. Do not allow them to be idle. The Handbook says to keep furbabies busy for “idleness leads to ignorance.” News flash, Handbook, furbabies LIVE to be idle. In fact, it’s one of their top priorities. Their idea of an awesome day. BAHAHA!! The Handbook LEGIT says that! Done and freaking done. They get at least one treat a day. Denta-treats are especially good, as they make their breath (more) tolerable. So, ladies and gentlemen, that’s a total score of 5/6—another A!!! WOOT WOOT!! I may have to change the title of this series to: I’m Totally Jane Austen And You Should Probably Be Jealous of Me. Err...maybe not. Haha!! Hilarious post, as usual! Plus, cute pictures of the furbabies! That deserves a bonus in my option. A+'s all around!